We made a trip to our favorite local orchard yesterday afternoon, and somehow, within mere minutes of arrival, we managed to pick about one billion pounds of apples. Or, rather, three large bags weighing 13, 12 and 16 pounds respectively. Mariam got to climb trees, and Dan had the opportunity to use one of those sticks with a basket attached to the top to pull apples down from the higher branches. Both were very pleased. We also gathered a few other fall harvest favorites that were on offer. A pumpkin, a big blue squash, some mums for the front porch. Apple pie for dinner, anyone? It feels like there is a whole lot happening around our house right now. Then again, all of the busy is comprised mostly of smaller events, chores, and tasks, and it makes it feel like there really isn't all that much happening at all. Just life. Dan's residency application will very likely go in today. As in, about an hour from now. He's been working overnight shifts in the emergency room the last couple of days and lining up the final metaphorical application ducks during the middle of the night lulls. We are applying to twenty-three programs. From sea to shining sea. The final word will be decidede via super computer and delivered in a sealed envelope on March 15th. Which is a Friday, by the way. Not that it is on our minds at all. Some people, who do not like to wear socks but do enjoy "singing along" to nineties Mexican pop music and Stevie Wonder, are mere days away from crawling. Days. Already. Sigh. Volume Nine of Alphabet Glue is well on its way to finished, but I will have to admit that my ailing macbook is making things a bit slow this time around. I still hope to be finished in time for an October 1st launch, but I'm definitely behind where I had thought that I might be at this time! We will have various wonderful and exciting out of town visitors over the next few weeks (parents, friends, new babies!) so I've decided to cut myself any necessary slack to just enjoy being with people while they are here. Ooh... Dan just came down the hall to say that he has officially pressed the "submit" button. Residency applications are in, folks. Fingers crossed! edit to add: I've been doing some housekeeping around the old blog. If you are an email subscriber or read through a feed, you might try clicking over to see some of the changes that I've made! Library Monday: A Wrinkle in Time. It would appear that we can officially add A Wrinkle in Time by Madeline L'Engle to the list of books that I was sure that I loved as a child until I read it aloud to my daughter and realized that either I had forgotten everything about it or, more likely, I had actually never read it at all. I just thought that I did. How did I miss out on reading this classic during all my years of childhood bookishness? It's hard to say, but my guess is that my teachers were too busy having me read things like Island of the Blue Dolphins and Bridge to Teribithia and other books that make you cry, like the endless permutations on the story where the boy has dog that he really loves and then it dies. Whatever the case may be, I have now officially read A Wrinkle in Time, and I am probably quite a bit better off for it. The first in a series of five popularly titled The Time Quintet, A Wrinkle in Time is told from the perspective of Meg, a teenage genius uncomfortably trapped in a daily routine that leaves her feeling like she never quite belongs anywhere. The disappearance of Meg's father, the secret nature of his classified scientific work for the government, and a series of unexpected meetings with a trio of old women (as well as with an eqully intelligent, if better adjusted, neighbor boy) eventually lead Meg and her gifted younger brother, Charles Wallace, on an adventure of otherworldly proportions. Indeed, A Wrinkle in Time is known for being a true classic of science fiction for young readers because as much as it begins in Meg's kitchen on a stormy October evening, the story quickly takes up residence on a series of far away planets where Meg learns the importance of trust, courage, forgiveness and love. The story is fast paced, full of unexpected and wholly riveting plot twists and includes unique takes on some favorite science fiction plot conventions. Meg's discovery of the power of love and loyalty leads the story to a satisfying conclusion, to be sure, but before that happens, the story brings some significant dramatic tension to the table. Indeed, I had a moment where I thought that I had made my biggest read aloud error of judgement since The BFG (after which I had to stand outside the bathroom door everytime Mariam brushed her teeth for a good six months and check outside her bedroom window for giants). So I would certainly caution parents of sensitive kids to approach carefully. There was one chapter that scared the proverbial pants off of the both of us, and my girl definitely struggled to get to sleep that night. However, the book's conclusion wasn't far behind that tense moment, which was helpful, and in the end, Mariam absolutely loved the book and is looking forward to the next. I am curious though... Five books is a big commitment in the scheme of read aloud things. Has anyone out there read the entire Quintet? Do you recommend it? I know that A Swiftly Tilting Planet is also supposed to be fantastic but I am certainly curious about the other titles now and would love to hear any feedback you might have! In the Glue Department: Good Glue for the Guys. Here and there I will get an email from a parent or teacher who is wondering if there are particular Alphabet Glue activities that are more likely to appeal to the presumably rambunctious boys in their charge. I generally send some kind of reply saying that I think Alphabet Glue is for everyone and their cousin too, but it occurred to me this afternoon that perhaps a bit more specific guidance might be appreciated for those who have inquired. Fair enough. Not that I even want to touch the controversial territory of boys vs. girls and who likes to do what. Because I most certainly do not. I just want to give a helping hand to some of you parents out there who are raising busy boys and are on the hunt for ways to incorporate a little bit of bookishness into that busy. 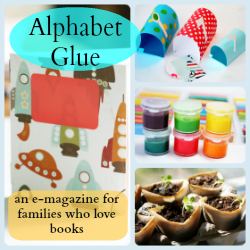 Here is a list of Alphabet Glue activities that I think translate well for boys who want to do something hands on, science-related or in the out of doors (and yes, I think that it is just fine to invite their sisters along too). And, with October on the way, I'm hard at work on Volume Nine. More about that very soon!